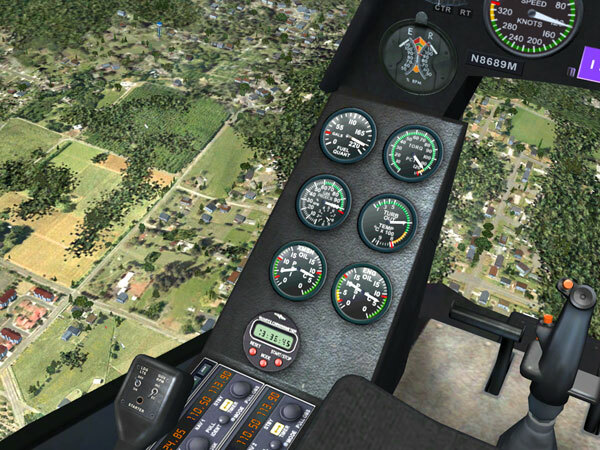 Flight Simulator is a great way to simulate real world aircraft and procedures, and do things strictly by the book. But there’s also a huge untapped potential: Why not use the technology to build the ultimate dream machine?  One that can outperform anything in the real world…and let you do things no real world pilot would ever attempt? 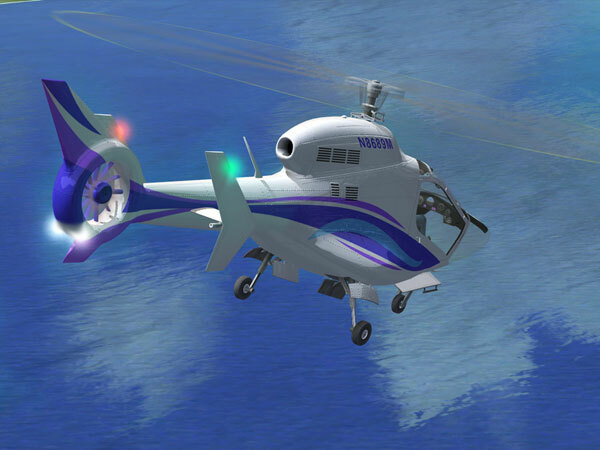 The helicopter you’d buy if you had millions of dollars burning a hole in your pocket…if only it existed! That’s the concept behind the Pyro. The Pyro is a single place, single engine turbine helicopter. Top speed is 330 knots, with a cruise speed of 300. Tight high-G turns, 360 rolls, insanely steep dives and climbs, and loops are all in its bag of tricks. And though it’s designed mainly with racing and aerobatics in mind, it also makes a great vehicle for sight seeing and just plain cruising around. Want to fly to that new scenery you’ve just installed? 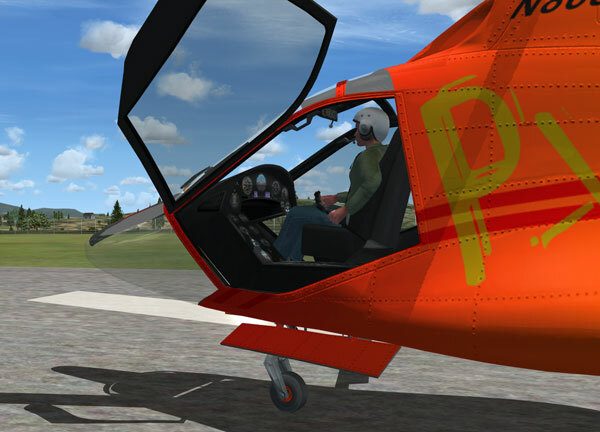 Why not choose the chopper that will get you there in no time flat, then let you enjoy the sights with its unparalleled view of the outside world? 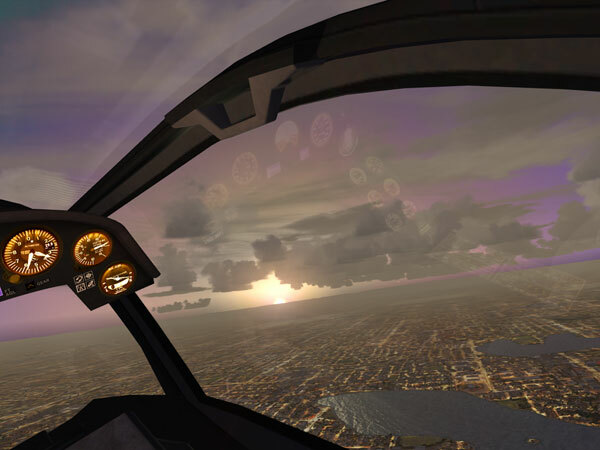 Though it’s pure fantasy, it’s as richly detailed and full featured as the most accurately simulated real world aircraft. The goal was to make it a thoroughly believable experience, and it takes its cues from extensive research into existing technology. Reality is fine…but don’t forget to have fun! 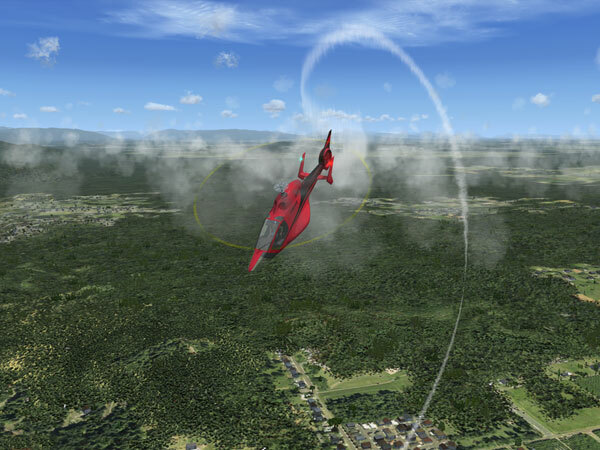 The Pyro will work with Microsoft Flight Simulator X (FSX), with or without Acceleration, under Windows XP or Vista. 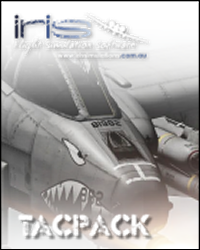 All testing was done with the (free) FSX Service Pack 2 installed. To fly this, saddle up, buckle up, and make sure your seat harness is strapped on tight. 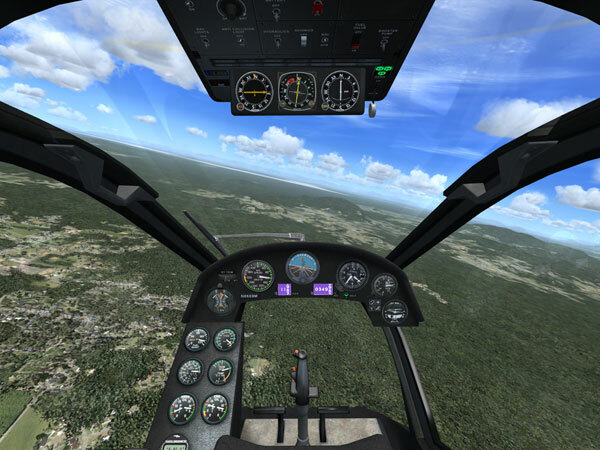 In my ongoing quest for a helicopter thrill ride I started exploring the single seater helicopters. Having 3 monitors with a total viewing area of 60" was hankering for some helicopter hot rodding joy ride for a Friday buzz around FSX Ville. 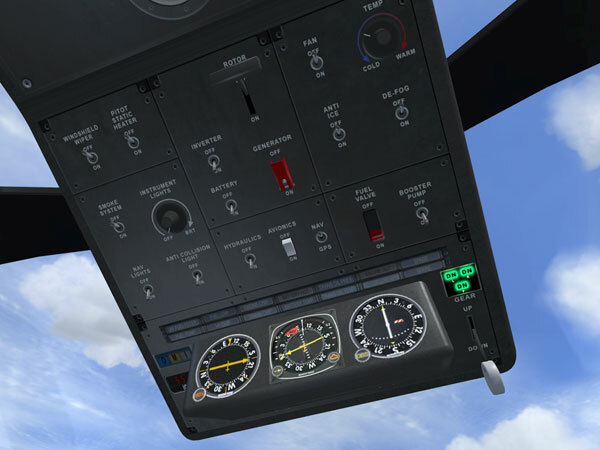 Having flown online for over 500 hours in some nice helicopters such as the 206 Bell Dodo Sim, Cera Bell 222 and 412, wanted a little more action and the need for speed. Stumbled upon the Pyro and it was right up my alley for some action type flying. The thing about having a wide field of view is the fun of doing a barrel roll. This is where the Pyro steps up to the plate. Agile, fast and enough pucker factor to satisfy any stick jockey. Flying nap of the earth at 300 knts, then banking and yanking, quick stops and turns, what's not to like? Going on a beer run takes on a whole new meaning with a Pyro, fast delivery means a cool one at one's favorite camping cite. Try doing that in a tight LZ with a fixed wing. The flight model is very nice, and cockpit a joy for sight seeing. 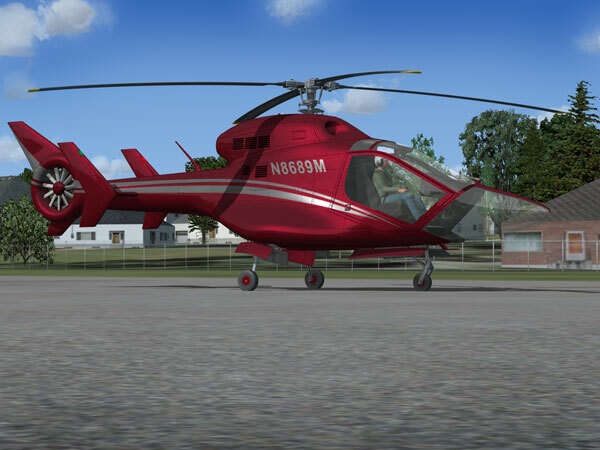 A helicopter of this quality should cost double, thus am a very happy camper with this helicopter. 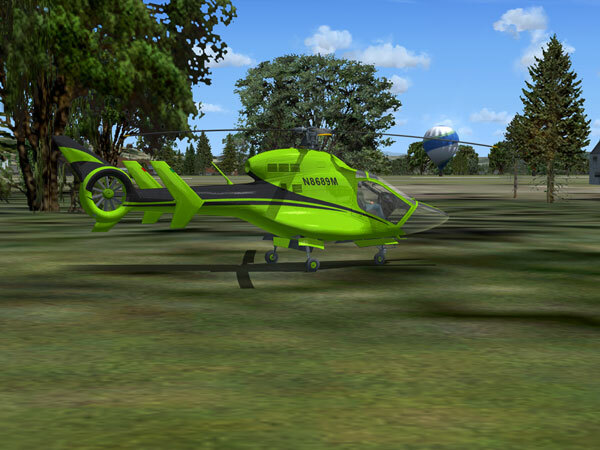 For turning and burning, or a relaxing fast flight from point A to B with great visuals, I recommend this helicopter. Great job Mick! Thanks. I agree with everything James has said on his review. This is amazingly fun and believeable. It is very FPS friendly even on my PC that struggles a bit with FSX. So whats wrong with it? 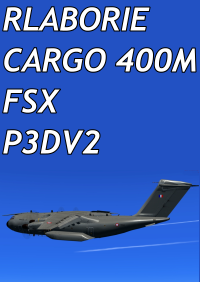 Just one thing - its not available for FS9! Thats all. Well done Pixel Cowboys. I usually shy shy from the concept helis and X planes. Usually they have super exaggerated performance thats just too unbeleivable. Instant acceleration,stops on a dime ect. But coming from guys with a name like, Pixel Cowboys, its either going to be very bad or very good. I am happy to say, the Pyro is VERY GOOD. The VR pit is crisp and clear. The gauges,interor all look polished and alot of time was put into it. No jaggies or bland textures. The view is also as good as it gets. They were not kidding when they said the Pyro is a perfect aircraft to view scenery from. 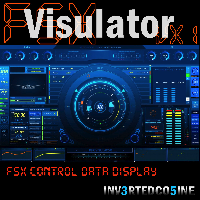 FPS on my system was simular to the FSX stock bell except at high speeds. Screaming at 250 plus at tree top level you can expect the same as you would with a fixed wing. Some stutters and pop ins are expected but I doubt you will be concentrating on anything else other than flying. Its a blast! Handling- Whooooaa. I had to turn my realism sliders all to mid way. This heli is a Ferrari with blades. Very nimble and very quick. It easily cruises at 250k and feels tight. I have not gotten into any acrobatics but the Pyro has a high performance fighter feel but still maintains that helicopter handling. Its a thin line betreen the two but they pulled it off. The soundset is also very good. One of the complaints about helis is that they are just too slow and it takes forever to get anywhere. Yet you want the vertical ability and handling. This heli fills that void perfectly.